The term dermatitis describes an inflammatory response of the skin, caused by contact with allergens or irritants, exposure to sunlight, or by poor circulation, even stress. 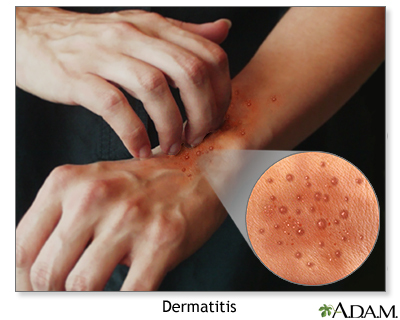 An example of atopic dermatitis is eczema, an itchy rash that produces redness, blisters and scaling. AVOID SCRATCHING. Scratching the rash may spread the inflammation, lead to infection and even leave scars. Atopic dermatitis occurs in individuals with tendencies towards allergies and who seem to have very sensitive skin. The persistent itching often encourages scratching, causing the skin to become raw or leathery. Here, the ankles and feet are affected. 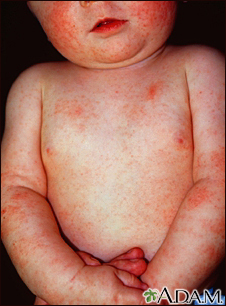 This view shows the red, scaly patches called plaques that are characteristic of atopic dermatitis. Keratosis pilaris occurs most commonly during childhood and produces small, rough spots, called papules, that are typically the same color as the skin. They usually appear over the outer surface of the upper arms and thighs, but may also occur elsewhere on the body. Dry skin, especially during winter months, makes the condition worse. Keratosis pilaris tends to be inherited and may be associated with atopic dermatitis. These red, scaly plaques on the legs are caused by an inherited allergic condition called atopic dermatitis. Many of these areas have been scratched until they are raw and infected, with the infection triggering and perpetuating the problem. In adults, atopic dermatitis frequently involves the body creases, such as inside the elbows and behind the knees.